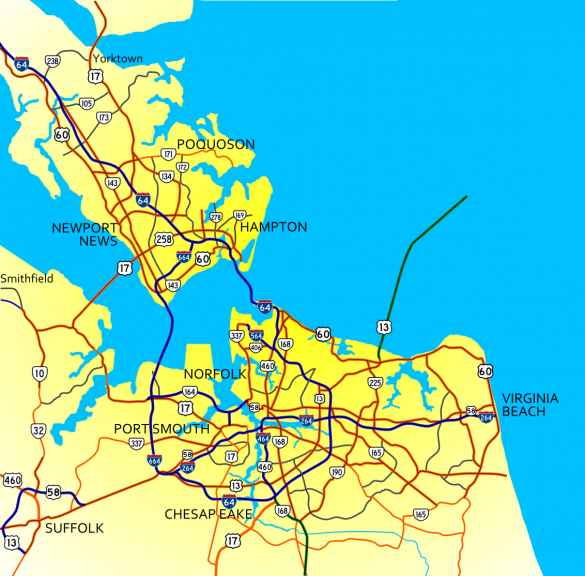 Hampton Roads consists of the cities Chesapeake, Hampton, Newport News, Norfolk, Portsmouth, Suffolk and Virginia Beach. The region is a military hub with several facilities including Norfolk Navy Base, Oceania Naval Air Station, Little Creek Naval Amphibious Base and Langley A.F.B. In addition southeast Virginia is home to a large shipbuilding industry with yards all along the branches of the Elizabeth River in both Norfolk and Portsmouth. The metropolitan area sees commercial districts in Downtown Norfolk and suburban Chesapeake and Virginia Beach. Older neighborhood areas can be found around Downtown Newport News, Hampton, Norfolk and Portsmouth. Suburban tracts spread throughout southern and eastern Virginia Beach, Chesapeake and Suffolk. The main freeway through Hampton Roads is Interstate 64. The route links southeastern Virginia with the state capital of Richmond and points west. Connections with Interstates 95 and 295 link Hampton Roads with Northern Virginia and Washington D.C. I-64 carries between four and eight lanes from Williamsburg to the eastern terminus in Chesapeake. Widening expanded the Hampton segment west of Interstate 664 to eight lanes from U.S. 258 (Mercury Boulevard) to Virginia 143 (Jefferson Avenue), including an HOV-lane during peak hours. At the James River, Interstate 64 crosses the Hampton Roads Bridge Tunnel. Completed in 1957 as a two lane facility, the crossing carries Interstate 64 and U.S. 60 between Phoebus in Hampton and Willoughby Spit in Norfolk. Construction upgraded the crossing with a twin two lane bridge by 1976. Completion coincided with the removal of tolls. Interstate 664 crosses the James River on the Monitor-Merrimac Memorial Bridge Tunnel. Opened in 1992, the bridge-tunnel system accommodates four lanes of traffic through a pair of 4,500-foot tunnels.4 I-664 bypasses Downtown Norfolk and Portsmouth to the west, providing the VDOT signed route from Richmond and northern Virginia to Nags Head and the North Carolina Outer Banks. The freeway carries four lanes northward from Suffolk to Newport News. The northernmost reaches of the freeway, also the oldest, are six lanes wide. First signed in 1997,3 the Hampton Roads Beltway was designated in an effort to ease motorist confusion on Interstate 64 in southern Hampton Roads. The beltway overlays all of Interstate 664 and I-64 from Exit 264 to Suffolk. Trailblazers for the beltway are generally paired with confirming markers along the respective mainline Interstates. The beltway was designated mainly to aid drivers along Interstate 64 south of I-264 and the Virginia Beach-Norfolk Expressway. With I-64 forming a loop south and then west from Virginia Beach through Chesapeake, cardinal directions posted along the freeway were misleading, with eastbound signs posted when the the lanes were traveling west and vice versa. By 2000, VDOT (Virginia Department of Transportation) removed cardinal direction designations from all Interstate 64 related signs southward from the eastern I-264 interchange at Exit 284. Coinciding with this sign change was the addition of Hampton Roads Beltway (HRB) shields with inner or outer banners. Prior to completion of the Oak Ridge Connector, and the subsequent Chesapeake Expressway, Battlefield Boulevard (Virginia 168) provided the main route between Hampton Roads and the Outer Banks of North Carolina. The state route traveled along an at-grade arterial through Great Bridge, and a two-lane road southward to the North Carolina state line. With the Outer Banks growing as a popular tourist destination, along with a population boon in Chesapeake, congestion along Virginia 168 grew. The Great Bridge Bypass segment of Virginia 168 predates the Oak Ridge Connector and Chesapeake Expressway portions by several decades. The Oak Ridge Connector, linking the Great Bridge Bypass with Interstates 64 and 464, was constructed in the late-1990s. Upon completion of the two-mile connector, Virginia 168 was relocated onto the new freeway (and I-64 between Exits 290 and 291), with Battlefield Boulevard renumbered as Virginia 168 Business. With the Oak Ridge Connector completed, work ensued on the tolled Chesapeake Expressway alignment south of Great Bridge. The project began at the state line, with construction of a four-lane boulevard north to Galbush Road. The toll road separates from the old alignment (Virginia 168 Business) at Galbush Road. The main line toll plaza lies north of Galbush Road and ahead of the first interchange with Battlefield Boulevard (Exit 5). Excessive rains from Hurricane Floyd and various winter storms hampered efforts, but crews were able to open the 6.4 mile long toll road on time before Memorial Day weekend of 2001.4 The Chesapeake Expressway is four lanes wide with a 55 mile per hour speed limit. Virginia 164 links Interstate 664 and the Hampton Roads Beltway with the Elizabeth River Tunnel connecting Portsmouth to Downtown Norfolk, and the Martin Luther King Freeway south to I-264. The Western Freeway provides an alternative to Interstate 264 while also serving freight traffic to Portsmouth Marine Terminal. SR 164 was never planned as Interstate 164. The numbering is just coincidental, as SR 164 falls in line with the Virginia route numbering convention (clustering). SR 165, 166, 168 and 170 are also posted within Hampton Roads. Historically, SR 164 was assigned along Laskin Road through Virginia Beach in the 1950s. Upon crossing into Virginia Beach, U.S. 13 follows Northampton Boulevard, a controlled access arterial southward to Interstate 64. A commercialized stretch ensues west from Diamond Springs Road, with U.S. 13 expanding to eight overall lanes through to the Hampton Roads Beltway. Within the Hampton Roads Beltway U.S. 13 follows Military Highway, a commercial arterial arcing south to I-464 in Chesapeake. Military Highway expands to eight overall lanes between U.S. 58 (Virginia Beach Boulevard) and Indian River Road. U.S. 460 combines with U.S. 13 west from Bainbridge Boulevard across the Elizabeth River to Bowers Hill, where the pair merge with U.S. 58 west through Suffolk. U.S. 17 joins Hampton Roads with Elizabeth City in northeastern North Carolina. Doubling as the Future Interstate 87 corridor, the route alternates between freeway bypasses and four-lane at-grade highways through to Williamston. Northward into Chesapeake, U.S. 17 previously followed George Washington Highway, a narrow two lane road through the Great Dismal Swamp. By Winter 2002, U.S. 17 was relocated from George Washington Highway onto Dominion Boulevard (Virginia 104), with the former route renumbered as U.S. 17 Business. Dominion Boulevard angles northeast initially as an at-grade highway. Construction completed in 2017 upgraded U.S. 17 across the Elizabeth River with a pair of high rise toll bridges, and the remainder northeast to SR 168 (Oak Ridge Connector) as a limited access highway. U.S. 17 ties into I-64 and I-664 at the north end of SR 168. The route doubles back to George Washington Highway west along side Interstate 64 between Exits 291 and Exit 296. Rejoining George Washington Highway, U.S. 17 continues north through the city of Portsmouth to Frederick Boulevard. Turning westward, U.S. 17 follows High Street, Western Branch Boulevard and Bridge Road into the city of Suffolk. Continuing into Isle of Wight County, U.S. 17 merges with U.S. 258 at Bartlett to cross the James River Bridge into Newport News. U.S. 17 & 258 part ways just east of the James River and U.S. 60 at Jefferson Avenue. U.S. 258 extends along Mercury Boulevard east through Hampton while U.S. 17 turns northward, paralleling U.S. 60 through Newport News. U.S. 58 carries a heavy amount of traffic along Virginia Beach Boulevard east from Norfolk to Virginia Beach. The arterial varies between six and eight lanes through to the split with U.S. 58 Business at Laskin Road. U.S. 58 Business continues Virginia Beach Boulevard eastward to the Oceanfront along the former alignment of U.S. 58. Laskin Road extends U.S. 58 to the Oceanfront north of the Virginia Beach-Norfolk Expressway. U.S. 58 wraps around the north side of Downtown Norfolk to connect with Brambelton Avenue west to the Midtown Tunnel. The tolled tunnel spans the Elizabeth River southwest to the Portsmouth Marine Terminal and SR 164 along the Martin Luther King Freeway. With just two lanes, the Midtown Tunnel opened in 1962 as the second tunnel between Norfolk and Portsmouth.4 The implementation of tolls at both the Midtown Tunnel, and the Downtown Tunnel along I-264, funded work on a second tube for the Midtown Tunnel. The new lanes opened to traffic on June 16, 2016. U.S. 60 travels the city streets of Newport News and Hampton via Warwick Boulevard, 25th & 26th Streets, and Kecoughton Road before merging with Interstate 64 to cross the James River on the Hampton Roads Bridge-Tunnel. U.S. 60 separates from I-64 at 4th View Street, just east of the Willoughby Spit. U.S. 60 straddles the southern shore of the Chesapeake Bay along Ocean View Avenue and Shore Drive in northern Norfolk and Virginia Beach. Shore Drive turns southward at Fort Story, taking U.S. 60 to Atlantic Avenue along the Virginia Beach Oceanfront. Midway along the Oceanfront, Atlantic Avenue shifts one block east from U.S. 60 with Pacific Avenue continued the US highway south to its end at the Rudee Inlet Bridge to General Booth Boulevard. Virginia 149 overlays 1.92 miles of Princess Ann Road north from Virginia 165 (North Landing Road) in eastern Virginia Beach. Summers, Stephen. “Interstate system route numbering.” http://www.nwindianahwys.homestead.com/INTER_MAIN.HTML. Hampton Roads Tunnels and Bridges – Home Page http://www.virginiadot.org/comtravel/hro-tunnel-default.asp – Virginia Department of Transportation (VDOT).